Jarritos translates to "little jars". On the bottle you see lots of little clay pots. Perhaps if they sold this beverage in such containers, it would withstand more than what my tile floor could give. I was given this bottle to review, and as soon as I stepped into my house, it fell and broke. My floor is still sticky. Being the nice guy I am, I went and purchased another bottle so this review could get done for the loyal readers of TheSodaJerks.net. 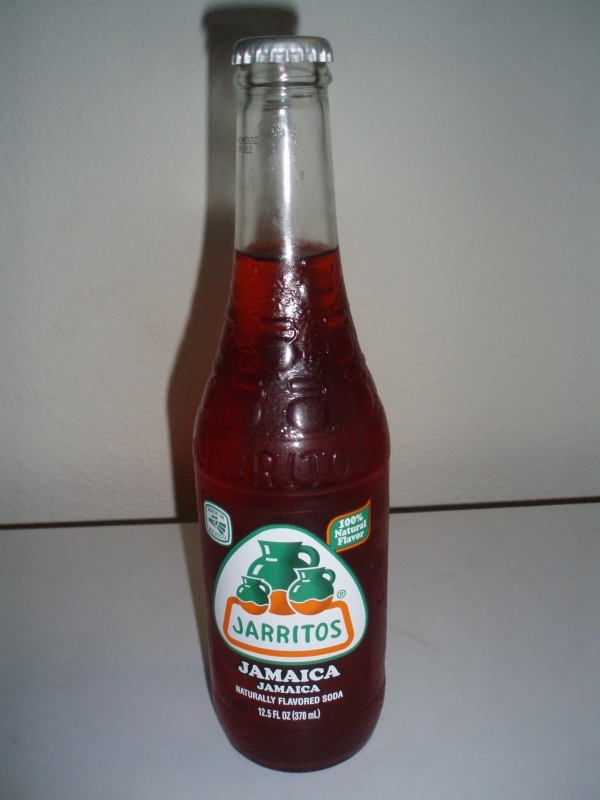 This flavor is Jamaica, which is translated in English: Jamaica. We actually know it better as Hibiscus. I've had Hibiscus flavored tea, but I don't know much about the fruit/flower/whatever it is. It sounds nice, though. I actually thought that it might be pot flavored because isn't that what Jamaica is known for? Thankfully I was wrong. The color is a bright red, so I was thinking that it would taste like a fruit punch. It actually kind of reminds me more of a sweet tamarind flavor. I know that flavor is very popular in Mexico, but I'm personally not a fan. It is sweet and refreshing, but there is a sour aftertaste that can be off-putting. I don't think I'll buy this flavor again, but I have to tell the readers to buy a bottle. I did. Maybe try another variety, however.